The display options allow you to enable/disable/alter different display features such as the post's byline and meta data, as well as the page meta data and licensing. This options section can be found under Dashboard > Appearance > Theme Options > Display Options. The Post Options section is where you can choose what kind of information you want displayed with each of your posts. You may want to show the author or date in the byline. You may want to show the categories and tags of your post in your meta data, or you may want to have a link to your comments there. You can choose your preferences on what information is displayed here, or you can choose to disable both the byline and the meta data. The post byline can appear before or after the post title and the meta data generally appears at the end of the post. Here, you can control how the post's byline is displayed (to enable/disable the byline check/uncheck its checkbox). You can choose whether the byline appears before or after the post title by selecting your preference in the dropdown menu. Here you can chose how the sentence structure of the byline is arranged by either selecting one of the two given templates or by using your own text with the available tags. Tags such as [post-author-link] and [date] will be substituted with the relevant post meta data, so arrange these to suit your needs. Here, you can control how the post's meta data is displayed (to enable/disable the post meta data check/uncheck its checkbox). Here you can use one of the predefined meta data templates, or assemble your own style using variable tags. 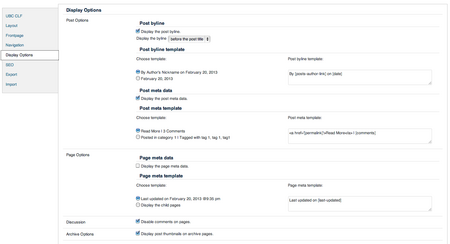 The Page Options section is where you can choose what kind of information you want displayed with each of your posts. You may want to show the time when the page was last updated or you may display the child pages. You can choose your preferences on what information is displayed here, or you can choose to disable the meta data. Here, you can control how a page's meta data is displayed (to enable/disable the page meta data check/uncheck its checkbox). Here you can choose one of the predefined meta data templates, or assemble your own using variable tags. You may choose to enable comments on pages (not to be confused with comments on posts) by checking off the Disable comments on pages checkbox found in this section. You may choose to enable post thumbnails to be displayed on archive pages by checking off the Display post thumbnails on archive pages checkbox.